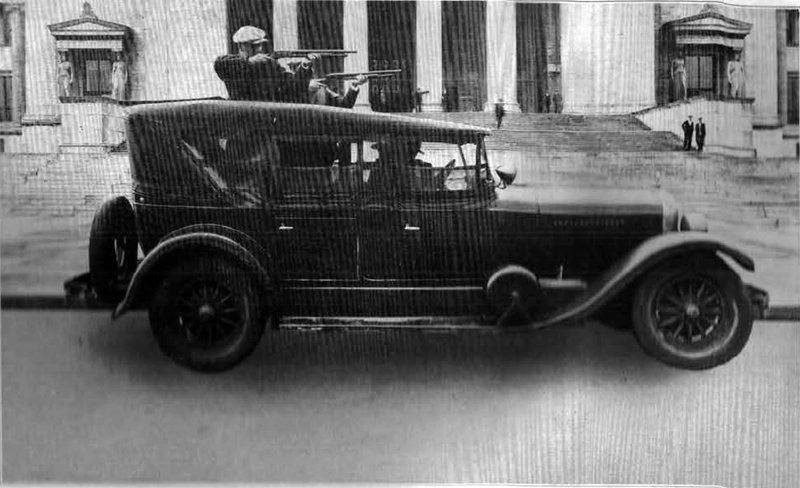 During the year 1920 there was one squad car assigned to the Detective Bureau manned by five men who worked shifts of twelve hours a a tour of duty. Their only equipment was the regulation police revolver carried as prescribed for the individual police officer. The territory assigned was the entire City of Chicago. The number of men assigned to the Detective Bureau at this time totaled only 175. During the years 1921 and 1922 five cars were added to the Detective Bureau , making a total of six, three to cover the south side of the city, one to cover the north side of the city, one to cover the northwest side of the city and one to cover the west side. A shot gun was added as equipment to each squad and the number of men increased to 200. Zone Squad Cars of the Chicago Police Department lined up for inspection in front of the Field Museum of Natural History in Grant Park. In December, 1923, seventeen zone squads were created and Wm. H. Schoemaker, appointed as Temporary Captain of Police, placed in charge. Each of these zone squads was assigned to two police districts of the city and as equipment, was provided with a shot gun. The number of men was increased to approximately 475. In the summer of 1924 three more squads were organized for zone work and one squad for taxicab work and the manpower brought up to 525 men. Each souad was provided with two regulation shot guns, a set of torches for illuminating purposes at night—tear bombs and flash lights. On May 28, 1926. ten additional zone souads were organized making a total of 30 squads and increasing the total number of men at the Detective Bureau to 675. At present every car operated as a zone souad car is a high powered Cadillac car kept in good condition. The Citv is divided into zones and a squad assigned to each zone for each eight hours tour of duty. The squad car is used by each of the three shifts, giving twentv-four hours service each day. These squads are an important factnr in the suppression and prevention of crime and give twenty-four hours service and protection with a minimum investment. A close-up view of a modern high powered Cadillac squad car with special top open showing the use thereof if necessary in chasing fleeing criminals in automobiles, Since the automobile is an adjunct to the modern criminal the Chicago Police Department has adopted high powered cars to cope with the new problem and these cars cruising on the streets have a decidedly deterrent effect on those who may be criminally disposed. Woman’s Voice on Phone Puzzles Sleuths for a Time. “Detective bureau,” sang out a feminine voice on the phone. One of Chief Mooney’s sleuth’s was endeavoring to make his regular morning report Friday. He knew he had the right number, but a woman’s voice from the bureau switchboard was a new one on him. He stood puzzled for a moment. “Say, Miss Operator, what are you doing on that phone? Where’s Schuler, the regular operator?” the sleuth asked. 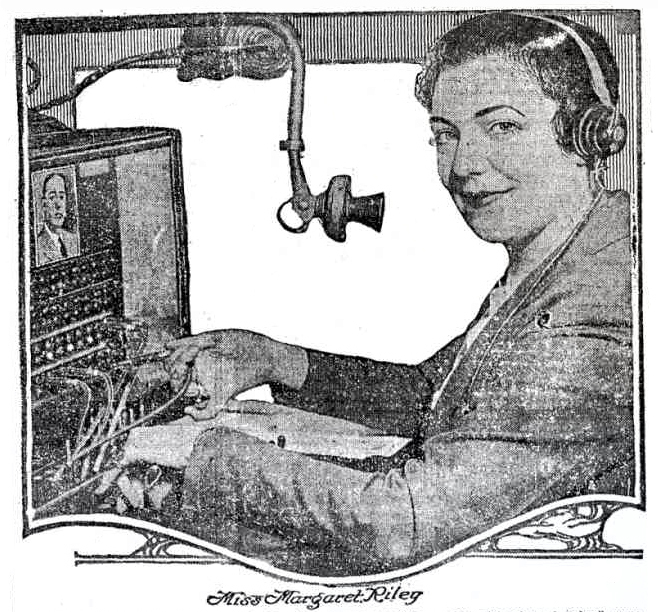 It was the first time on record that a woman had charge of incoming calls. My grandfather FRank Daley was chief of the Detective Burea in thethe early 20th century. Does anyone have any records of his service? My grandfather Frank Daley was chief of the Detective Bureau in the early 20th century. Does anyone have any records of him or his service?